Building a pond for your garden is not nearly as complicated as I first thought it may be. I built a pretty little pond in my front yard just off the front walk and next to the porch. Here, I could sit and enjoy the sights and sounds. And I did it in a weekend without ANY professional help! 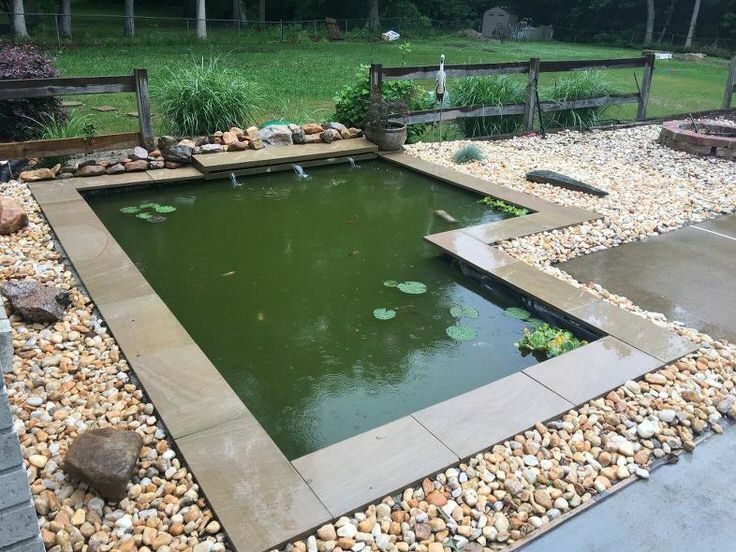 Here’s how to build a pond, and tips on easy maintenance as well. Plus, we have other bloggers DIY pond tutorials as well… Just in case you are looking for something different for your backyard water feature! Step one– Rough out the area the size you want your pond. A pond can be as large as you wish, but I chose to make mine approximately 4×8 feet. Check with your local code if you plan to place the pond in an unfenced area…some towns limit the depth of the pond if it is unfenced, usually to 12 inches. Decide if you just want a decorative pond, or a complete water garden with live plants and fish. I chose a decorative pond with a fountain feature, but keep in mind a water garden will require a deeper pond with more maintenance. Step two– Once you have the pond shape marked with either paint, chalk or a spare hose laid out on the border, its time for the hard work! Dig! My original pond was 18 inches deep to allow for some goldfish my children wanted. Goldfish are tough as nails, but keeping up with the algae was tougher! When doing some repairs the following spring, I removed the fish and backfilled my pond until it was only 12 inches deep. 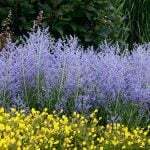 Whatever you choose, excavate the pond to the desired depth and try to keep the sides as vertical as possible. This will make it easier to hide the liner later. Lay some material in the bottom of the pond to cushion the liner against rocks, sticks and other items likely to punch holes. Good low budget ideas are newspaper, old carpet or even sand. 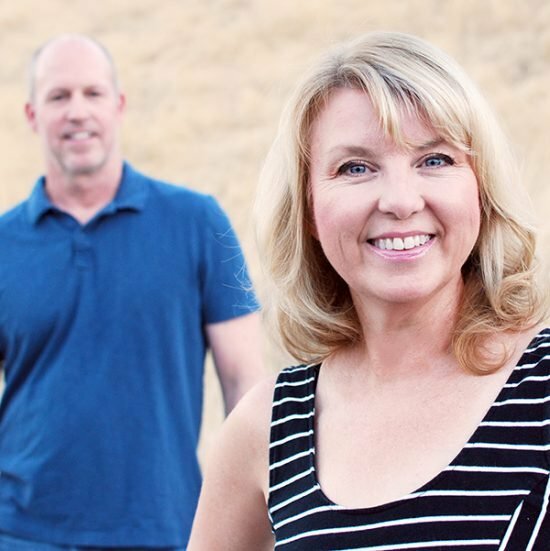 Step three– Purchase a pond liner from your local supplier or discount store. Measure your pond depth x 2 and add to the length plus 2 feet- that is the length of your liner. Your pond depth x 2 added to the width plus 2 feet- that is the width of your liner. The extra 2 feet allows for fitting and cutting away of the excess. 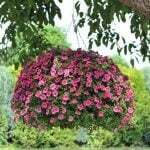 Lay the liner over the pond and fit into the bottom, fill halfway with water and allow to sit several hours or overnight to settle the soil. 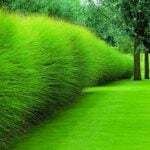 Trim the liner to hang just 3-4 inches over the lip of the pond…that few inches is important, better to trim too little than too much, you can always go back later and re-trim. If you are going to add a fountain pump, place it in the pond now. 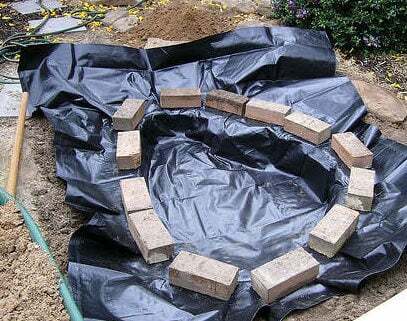 Step four– Now you want to hide the edges of the pond liner with rocks. Flagstone in my part of the country is pretty expensive, so I figured out a way to get the flagstone look for only $25. I picked up a case of slate floor tiles, and used a hammer to break them into pieces. I lay the slate over the lip of the pond with the broken side facing the pond center. Then I hid any smooth edges of the tiles with river rocks from my yard, simply layered on top of the slate. You can also use the local rocks to hide any excess pond liner as well. Plug in your fountain pump, and set it onto a brick to achieve the right height if necessary. Make sure you have a GFI outlet to plug into, if not, consider a solar pump. Step five– Add plants and accessories around the pond to make it a welcoming place for all your visitors! Be sure there is seating nearby. A birdfeeder in the nearby trees will ensure a steady supply of feathered friends to enjoy your pond oasis! First two photos in this tutorial were from ‘EHow‘, this one is my actual finished pond. 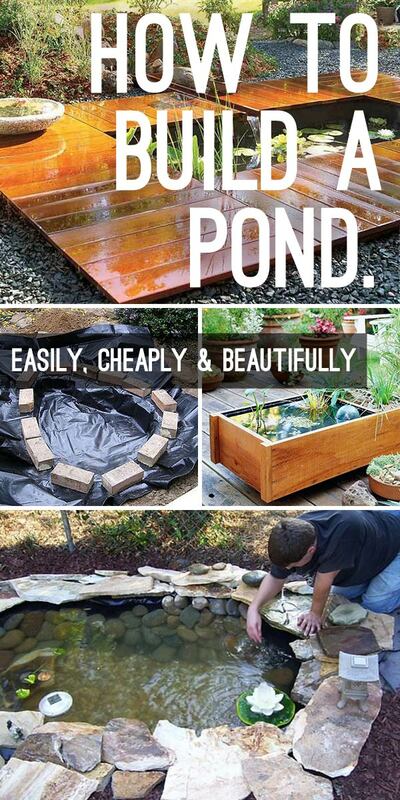 You can build a pond without breaking the bank! There are many algae controls available for those not interested in learning the complexities of creating a natural biological environment in their water garden. Even discount stores carry such supplies the garden section. A small amount of bleach will also keep the water clean, though you must be careful to use small amounts. Avoid this method if wildlife frequents your pond. 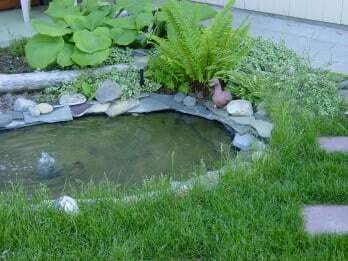 These backyard pond ideas are fast, easy and a showstopper that will add real value to your garden and your home. But if you want to get a little bit fancier, learn how to build a pond and a deck with this complete tutorial from ‘Family Handyman‘. Love the look of this backyard pond. Yes, it’s more expensive than mine, but wow! And it is still a simple project! 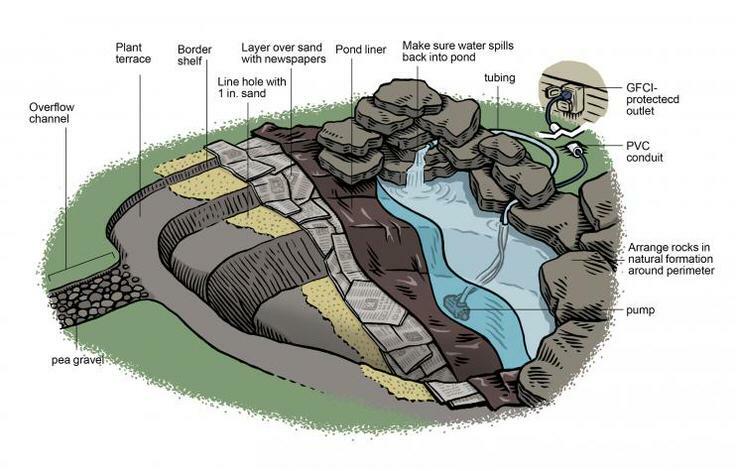 ‘This Old House‘ has an illustration on how to build a DIY pond that might help you visualize the “layers” required to get this project right. They also have a full step by step tutorial. 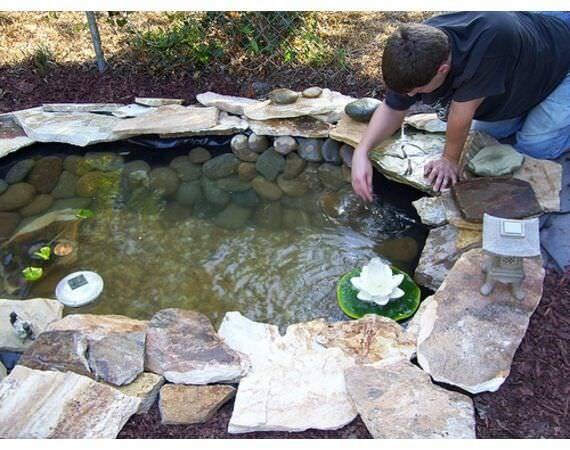 From ‘Creative Fish Studio’ via ‘Hometalk‘, try this more modern DIY pond for your backyard! Be careful though, make a pond this big and the kids might want to swim in it! He made his into a backyard Koi pond. Step by step instructions, plus links to a video tutorial! Don’t want to dig all that dirt building a pond? 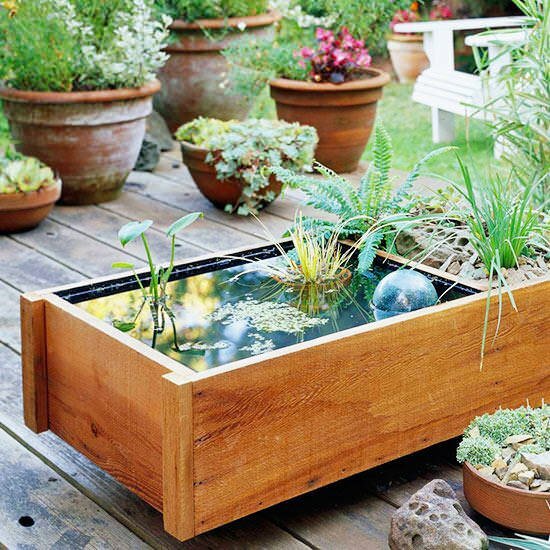 No problem, try this DIY pond in a box, from ‘BHG‘. 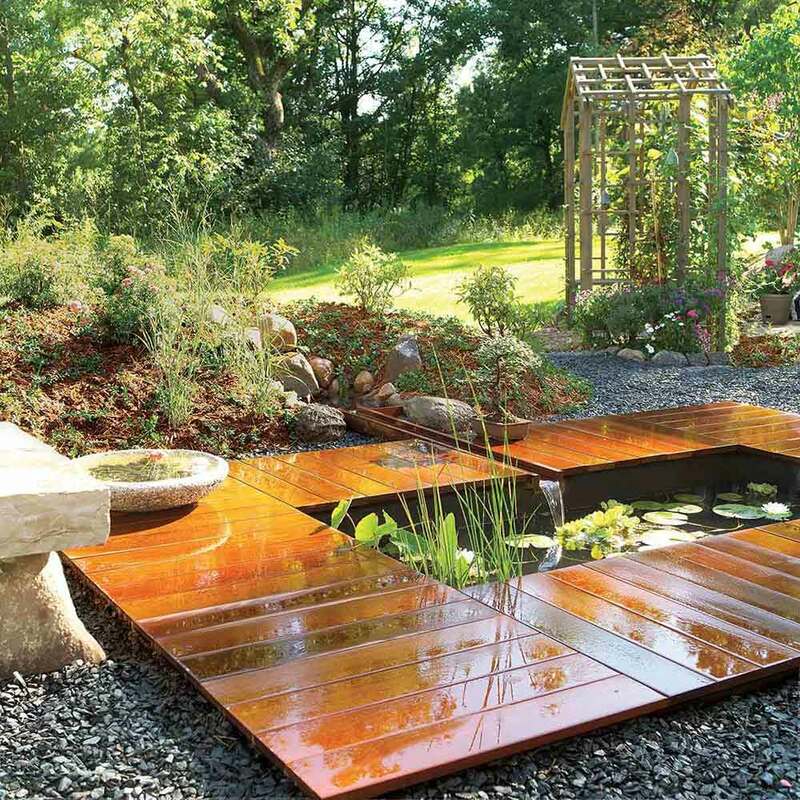 Set this outdoor pond on your patio, or tuck it into your garden along a path for a sweet surprise. Complete instructions. Ok, time to build a pond in your backyard, right? We think you will also want to check out our post on Perfect Pond Plants and Easy DIY Container Water Gardens! 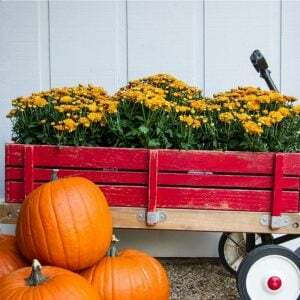 ← Fall Lawn Care Tricks for a Killer Lawn in Spring! 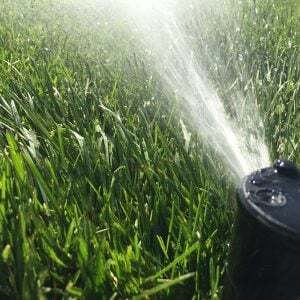 Fall Lawn Care Tricks for a Killer Lawn in Spring! How can we get rid of mosquitoes and algae?? Pond supply stores have additives for both those problems! what maintenance one needs to do to keep the pond looking new especially to keep out algae. 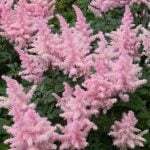 There are additives that you can buy wherever they sell pond supplies that fight algae, and it also helps to position the pond in the sun. We clean ours out and refill it in the spring and fall… Hope that helps! Wow! I love the dry stacked round rocks on the sides! I’m going to have to try this in my pond! How did you get your your stones to stay on the walls of your pond? For us they were just dry stacked! i’ll try to make one.